I am proud to have grown up in Chicago. It is a great city. But us Chicago fans have to admit to its numerous mistakes and sins. One of those sins was repeated over and over again in the mid-twentieth century, when neighborhood after neighborhood was torn apart to make way for highways. Working class neighborhoods, homes to people of color and immigrants … the fabric of community life was torn away. Neighborhoods were divided and conquered and made into ghettos. One would hope for Silicon Valley in the twenty-first century not to repeat the mistakes of twentieth-century Chicago. On Wednesday, the Santa Clara Planning Commission will review the Environmental Impact Report for the Lawrence Station Area Plan. The Lawrence Station Area Plan is an ambitious project to redevelop a low-rise industrial area into a modern urban neighborhood, providing 3,500 housing units, office space, and parks, directly adjacent to commuter rail services. 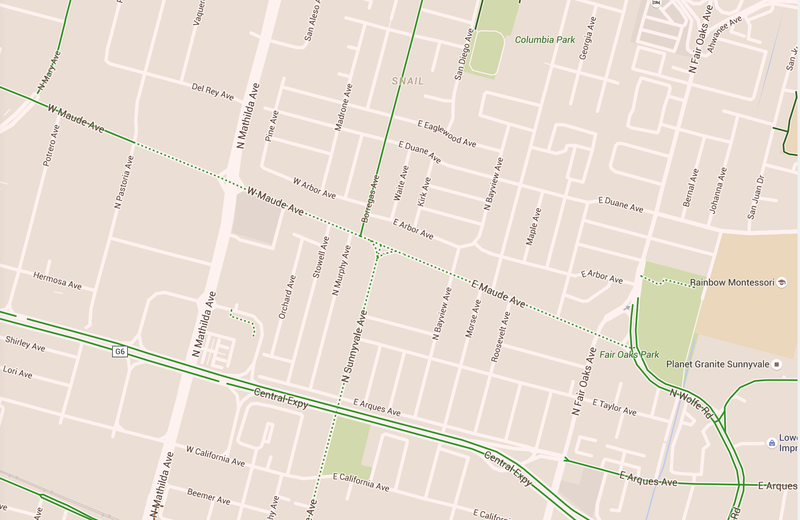 The Lawrence Station Area as it exists today: mainly low-rise industrial. 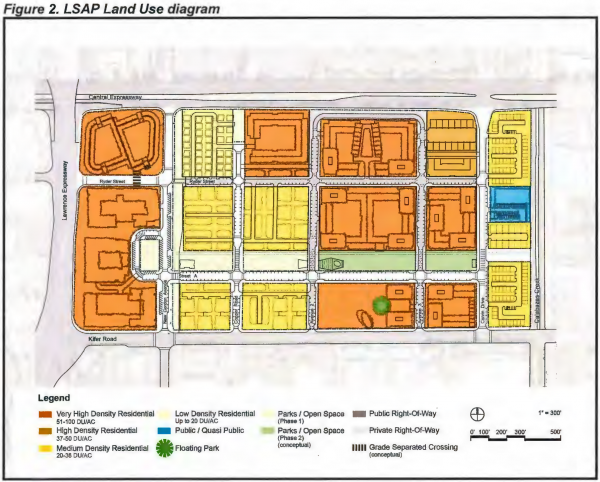 Plans for 3,500 residential units, 104,000 square feet of office, and six acres of parks. Among the current recommendations is to cut off the Northwest block of housing from the rest of the neighborhood because it serves as a connector ramp between Lawrence and Central Expressways. Instead of crosswalks for people to walk across their community, pedestrians will need to walk up and over a ramp so as not to slow down the cars … on a two-lane road. It is hard to find pictures of pedestrian bridges spanning two-lane roads. 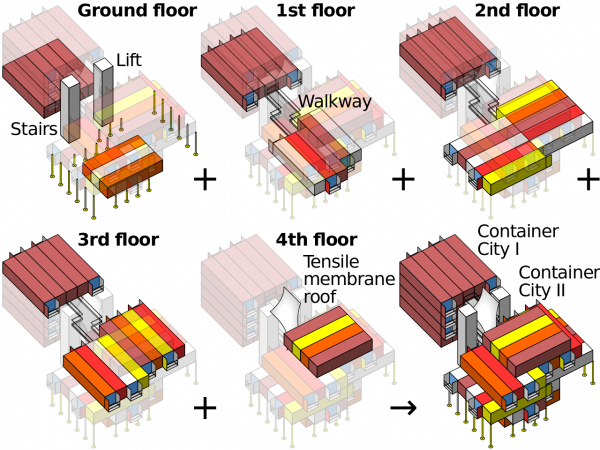 Picture something like this, with elevators on each side. This is another case where we err on the side of inconveniencing people and dividing neighborhoods for the sake of keeping cars moving along as fast as possible. A crosswalk would allow people to cross the street in their new neighborhood and be better connected to their neighbors, at the cost of possibly adding an occasional minute or two to someone’s commute. Does that sound so unreasonable? Perhaps instead of right-left-right through a neighborhood, we could drive a gentle arc around the neighborhood. The path is still there. We might explore some alternatives. One thing I notice is that the right-of-way still exists to restore the old on-ramp from Lawrence Northbound to Central Eastbound. Instead of making a right-left-right through a residential neighborhood, drivers just coast on up a gentle right-hand curve and merge on to Central. From there, the existing two-way on-ramp might be adapted to a two-lane one-way street. The two-lane street allows more cars to queue at a crosswalk while pedestrians cross, reducing potential congestion. Alternatively, traffic off of Central Eastbound could simply take alternate routes from Oakmead/Corwin. The Santa Clara Planning Commission is in a place to recommend smarter planning that better addresses the concerns of pedestrians, neighborhood vitality, and motorists. The Commission will review the Specific Plan this Wednesday at 7:00pm. I hope to drop by and share my concerns. You should show up too, if you are interested. You can also write a letter to the Planning Commission: PlanningCommission@santaclaraca.gov and CC planner John Davidson: JDavidson@santaclaraca.gov. Many thanks to Green Caltrain for the tip. This time around I figure condoms, ammunition, and plastic bags are issues Cal/OSHA and the legislature need to figure out. 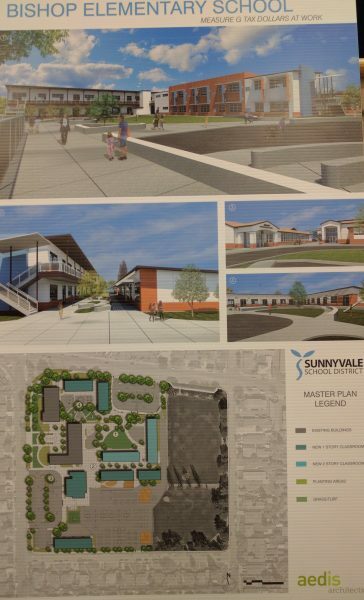 Earlier this month I attended a meeting at Bishop School in which Rob Smiley, COO of Sunnyvale School District, brought us up to speed on the current construction plans. I took noted and shared on Nextdoor.com, and I’m sharing them here for better community access. Renderings of new campus and a site plan. Q: When does Maude Ave bike lane (remove parking) happen? On October 10, 2016, file 16-0548 was heard by the Sunnyvale Planning Commission. The item was to down-zone a condominium development per the General Plan, and to up-zone a one third acre parcel from Residential Low Density to Residential Low-Medium Density. By up-zoning the site at 838 Azure St, the property owner would be able to build four homes on the property instead of a maximum of two. The Planning Commission passed the down-zoning proposal but denied the up-zoning at 838 Azure St. 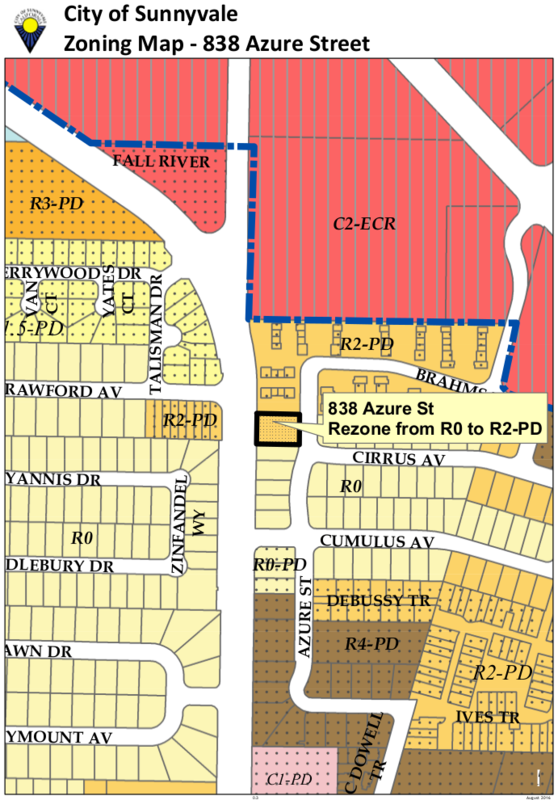 I do not believe the decision with regard to 838 Azure was consistent with the public interest of Sunnyvale residents. At a time of housing crisis, we should err on the side of providing more affordable homes for more families, and the location at 838 Azure is well suited to providing housing with minimal impact on congestion. The property presently hosts two dilapidated structures which had recently housed squatters. There are dying trees and contaminated soil from Sunnyvale’s orchard days. The lot in question is about 14,400 square feet, and present zoning allows for up to two houses. At 45% FAR one can build two homes of 3,200 square feet. Comparable homes in the area are typically 5 bedroom, 3.5 baths at $2,400,000. With a 20% down payment of $480,000, a 30 year fixed mortgage at 3.875% with taxes and insurance runs nearly $12,000/mo. On the other hand, a 1,600 square foot townhouse or condo in this area is typically 3 bedroom, 2.5 bath at $1,000,000. With a 20% down payment, a 30 year fixed mortgage, taxes, insurance runs nearly $5,000/mo. If we assume that housing is “affordable” at 33% of Gross Income, then the big houses are affordable to a family with $436,000 annual income, and the smaller homes are affordable at $182,000. 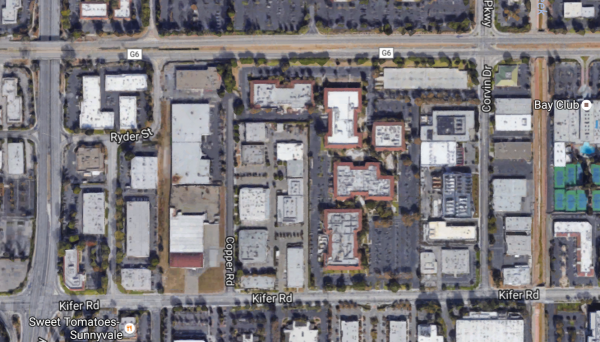 Much of Sunnyvale is poorly suited to walking or public transportation. Housing in such areas encourages automobile trips and results in congestion. If you want to increase housing while avoiding congestion, you want to place the housing in areas where walking and public transit are viable options: when people have the option not to drive they are less likely to add congestion. 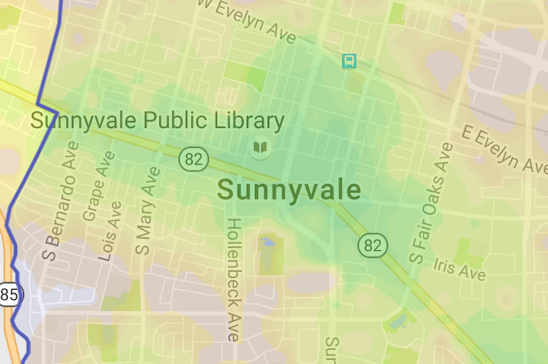 The average Walk Score in Sunnyvale is 55. For 838 Azure the walk score is 78. The site is well within Sunnyvale’s walkable downtown core, a very close walk to multiple groceries, restaurants, and Murphy St. This pedestrian accessibility does not encourage automobile trips, thus it mitigates congestion. The site is very near VTA’s premier bus route: the 22/522 El Camino Real, as well as the 55 and 54 routes for North-South mobility. 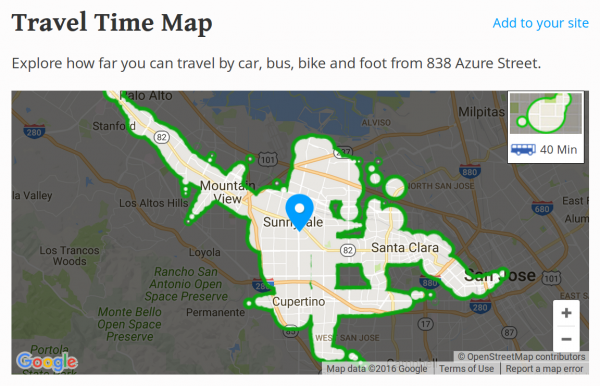 Within an hour, public transit can get residents across Sunnyvale, including the offices on the North Side, as well as much of Cupertino and Santa Clara. 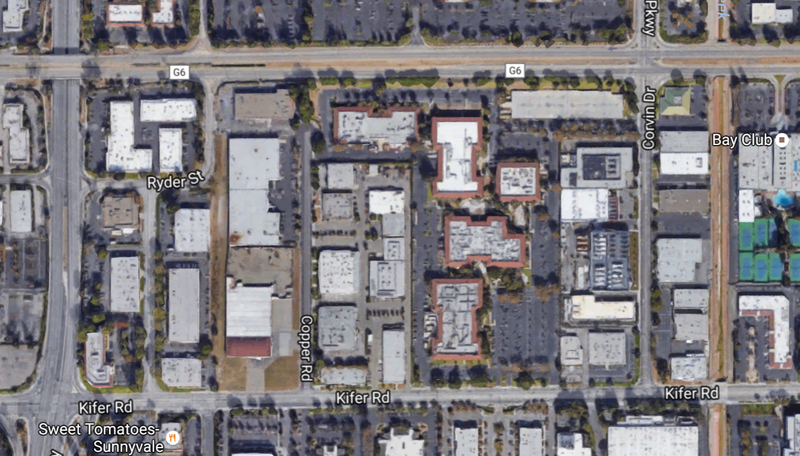 The downtown areas of San Jose, Mountain View, and Palo Alto are accessible. 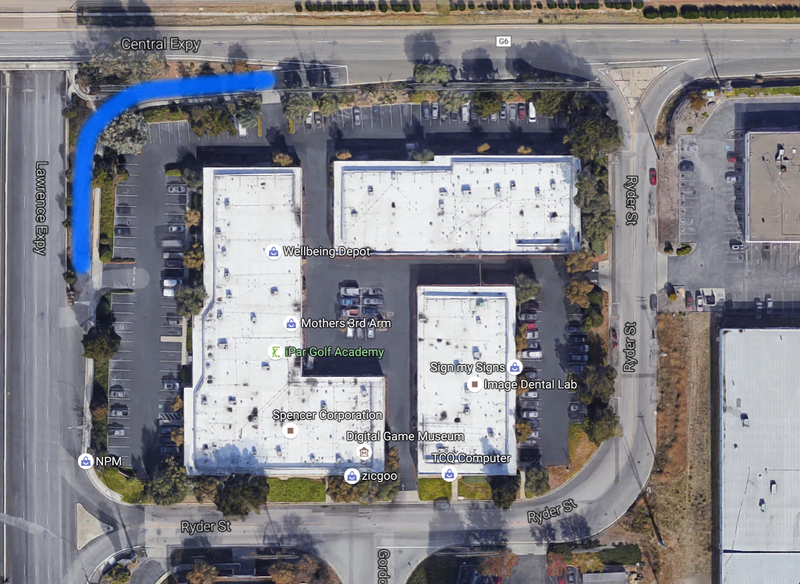 At just over a mile to Sunnyvale Station, the site is not a convenient walk to Caltrain: residents may prefer to bicycle. Via Walk Score: where you can get from 838 Azure via public transit. Two neighbors spoke against the zoning change. A neighbor who lived in an adjacent townhouse was concerned that the development of townhouses on the neighboring property would not meet his aesthetic standards. A neighbor to the south was concerned that his dogs might get out if the property was developed, and that if the driveway were moved from Sunnyvale-Saratoga to Azure then there would be less street parking available on Azure. Commissioner Melton noted that the benefits of the GPA and Rezone of the Azure site are the PD designation and an increase in housing density, and that the negatives include parking, neighborhood incompatibility and inappropriate density. Commissioner Simons said he does not like the potential spot zoning of 838 Azure. MOTION: Commissioner Melton moved and Commissioner Simons seconded the motion to recommend that City Council deny the General Plan Amendment and Rezone for 838 Azure Street. Vice Chair Rheaume said he is not supporting this motion and supports increasing the density of this lot. This item should come before the City Council on November 1. Anyone who might wish to speak up on behalf of the virtue of increased housing in Sunnyvale can contact the City Council or make a public comment of up to three minutes at the upcoming council meeting. I am hoping to attend and speak November 1. If you think you might also be interested, or would like to be notified of any updates, please drop me a line: dannyman@toldme.com. This item was considered by the Sunnyvale City Council on November 1, 2016. City Council heard testimony from City Staff and the Property Owner. City Council candidate John Cordes and I made public comments in favor of the change. A few neighbors made public comments against the change. 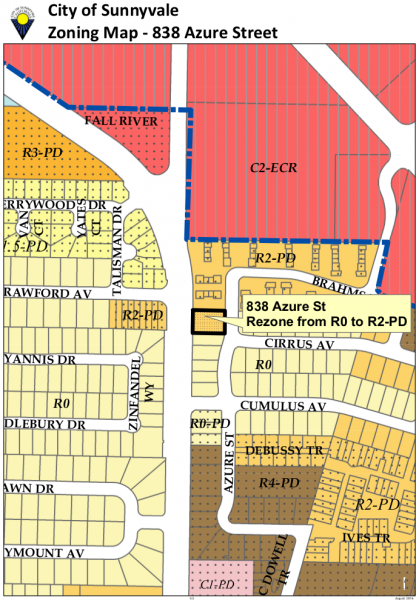 The City Council enacted an ordinance to change the zoning at 838 Azure from R0 to R2-PD. The vote was 6-1, with Council Member Pat Meyering in dissent. Council made it clear that they were only approving the zoning change, in order to provide more housing in an area well-suited to pedestrian, bicycle and public transit. Council was generally most concerned with how the development would transition from the adjacent R2 zones to the rest of the neighborhood, which is among the several considerations which will be addressed subsequently in the planning process. The Property Owner is now at liberty to submit plans for development, which will be subject to review by the Zoning Administrator, with community feedback, and potentially by the Planning Commission and the City Council. This year there will be an election for four of the seven seats on the Sunnyvale City Council. 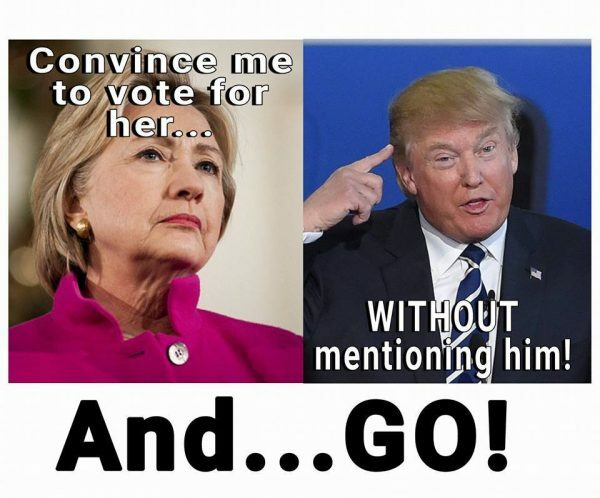 I found a nice web site that summarizes campaign contributions for the different candidates. As I have only recently taken an interest in the City Council, it helps me paint a crude picture of the council as it exists today. There seems to be a core majority and an independent minority. Caveat: it has been pointed out to me that my data source is not entirely accurate. Raw data can be obtained directly from the city. Unfortunately, that data is provided in PDF format. If I find a convenient way to parse the data out of those PDF files, I’ll take a crack a re-doing the Financial Backings visualization, below. Heading up the “Core” are Mayor Glenn Hendricks and Vice Mayor Gustav Larsson, who have each received overwhelmingly large sums from the National Association of Realtors Fund. Jim Griffith is an Software Engineer who has mainly bankrolled his own campaigns. He is the only second-term member of the council, thus his cumulative financial backing is larger than most members of the council, with the exception of Mayor Hendricks and Vice Mayor Larsson. Jim maintains a blog about city council activities at dweeb.org. Next are what I would label the “Friends” which includes Larry Klein and Tara Martin-Milius. Klein very recently won a special election held in August after the resignation of Dave Whittum. Neither of these candidates have the volume of donations as Hendricks, Larsson or Griffith, but the Inner Core have made friendly contributions to the Friends. Martin-Milius has received contributions from Hendricks, Larsson, and Griffith while Klein has received contributions from Hendricks and Griffith. The Inner Core and Friends make up a five-member majority. Council motions are often made and carried with minimal dissent. Beyond the Core are the two “Independents.” Jim Davis‘ campaign contributions are mainly from non-resident individuals, none from the Core members. He generally votes along with the Core, though he did vote against the Maude Ave bike lane, an issue which I took a special interest in. Pat Meyering‘s campaign is completely self-funded. He often clashes with Mayor Hendricks and other members of the council. The Deep Pockets (Hendricks, Larsson, Griffith) are not up for election this year, but everyone else is. Seat 4: Recently won by Larry Klein, is challenged by John Cordes and Mike McCarthy. Klein, who recently served on the Planning Commission, is backed by a few Business and Real Estate PACS, and several residents, including the Core council members, and Stephen Williams, who ran against him in the special election. John Cordes, who also ran against Klein in the special election, is an environmentalist who serves on the Bicycle and Pedestrian Advisory Commission. 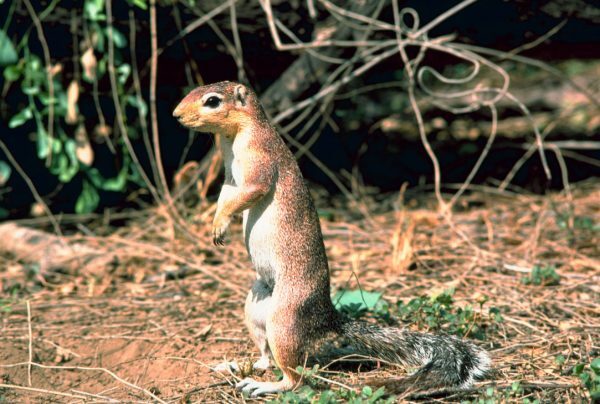 He is mainly self-funded, with an even split between resident and non-resident contributions, and a single PAC donation from the California League of Conservation Voters. Mike McCarthy is entirely self-funded. Seat 5: Incumbent Pat Meyering is solely self-funded, and I could not find a campaign web site. He is challenged by Russell Melton, who has served several terms on the Planning Commission, and has the support of several developers, the Core council members, and numerous individuals. Melton also managed Mayor Hendricks’ successful 2013 City Council campaign. Seat 6: Incumbent Jim Davis is a former Public Safety Officer who has served many government and community organizations. He is funded mainly by non-resident individuals. Challenger Nancy Smith has chaired the Santa Clara County Water District Environmental and Water Resources Committee, and is funded by several residents and non-residents. Seat 7: Incumbent Tara Martin-Milius is funded in the main by several individuals, including Core council members, along with business and real estate contributions. She is challenged by unfunded Ron Banks and self-funded Michael Goldman. In an attempt at objectivity, I have compiled the following table to provide a quick reference to in understanding the Council and the election. I welcome feedback, especially factual corrections. I read The New Yorker too much when I had free time and the gist of it was: Earth’s climate is usually pretty erratic, but after the last ice age, about 10,000 years ago, the climate entered an unusually stable phase. At that point, our species, after 200,000 years, for some reason, mastered agriculture and civilization, and that civilization has disrupted this stable phase and we are moving back into unstable climate patterns. Whether the world civilization can continue without the original agricultural lynch pin of a stable climate is a question which will be answered within our lifetimes. Earth’s Average temperature. Our species emerged around the 200 mark, agriculture and civilization start at around 11 where you see that flat red line, which ends .. now. I had mixed feeling watching the Democratic National Convention because on the one hand they acknowledge that Climate Change is a Real Thing and we Ought to Do Something but then they kept reassuring us that it was just one of those kind of good things to do for future generations and not actually some kind of imminent shitfest that is going to be a bigger and bigger problem every year for the forseeable future, not to mention that we’ve already pretty much screwed the pooch anyway by ignoring the issue so we get to deal with it anyway but will still need to address climate emissions to keep it from going from pretty awful to worst case scenario. It starts with floods and droughts, then crop failures, famine, mass migration, political turmoil, fascism … talking about sea level is burying the lead. See Also: http://xkcd.com/1732/ — a cartoon illustrating human history versus the temperature record depicted in the final panel. I’ve been a SysAdmin for … since the last millennium. Long enough to see certain fads come and go and come again. There was a time when folks got keen on the advantages of chroot jails, but that time faded, then resurged in the form of containers! All the rage! My own bias is that bare metal systems and VMs are what I am used to: a Unix SysAdmin knows how to manage systems! The advantages and desire for more contained environments seems to better suit certain types of programmers, and I suspect that the desire for chroot-jail-virtualenv-containers may be a reflection of programming trends. On the other hand, if you’re hacking away in an interpreted language: say Python or R, you’ve got a growing wad of dependencies, and eventually you’ll get to a point where you need the older version of one dependency and a bleeding-edge version of another and keeping track of those dependencies and convincing the OS to furnish them all for you … what comes in handy is if you can just wad up a giant tarball of all your stuff and run it in a little “isolated” environment. You don’t really want to get Ops involved because they may laugh at you or run in terror … instead you can just shove the whole thing in a container, run that thing in the cloud, and now without even ever having to understand esoteric stuff like chmod you are now DevOps! Anyway, as a Service Provider (… I know “DevOps” is meant to get away from that ugly idea that Ops is a service provider …) I figure if containers help us ship the code, we’ll get us some containers, and if we want orchestration capabilities … well, we have what we have now and we can look at bringing up other new stuff if it will serve us better. It turns out it is not just me who is a curmudgeonly contrarian: a lot of people are freaked out by the True Believers. But that needn’t keep us from deploying useful tools, and my colleague reports that Kubernetes for containers seems awfully similar to the Ganeti we are already running for VMs, so let us bootstrap some infrastructure and provide some potentially useful services to the development team, shall we? I recently started using sslmate to manage SSL certificates. SSL is one of those complicated things you deal with rarely so it has historically been a pain in the neck. But sslmate makes it all easy … you install the sslmate command and can generate, sign, and install certificates from the command-line. You then have to check your email when getting a signed cert to verify … and you’re good. The certificates auto-renew annually, assuming you click the email. I did this for an important cert yesterday. Another thing you do (sslmate walks you through all these details) is set up a cron. This morning at 6:25am the cron got run on our servers … with minimal intervention (I had to click a confirmation link on an email yesterday) our web servers are now running on renewed certs …. one less pain in the neck. “Hillary Clinton understands that we must fix an economy in America that is rigged and that sends almost all new wealth and income to the top one percent. Hillary Clinton understands that if someone in America works 40 hours a week, that person should not be living in poverty. She believes that we should raise the minimum wage to a living wage. And she wants to create millions of new jobs by rebuilding our crumbling infrastructure. 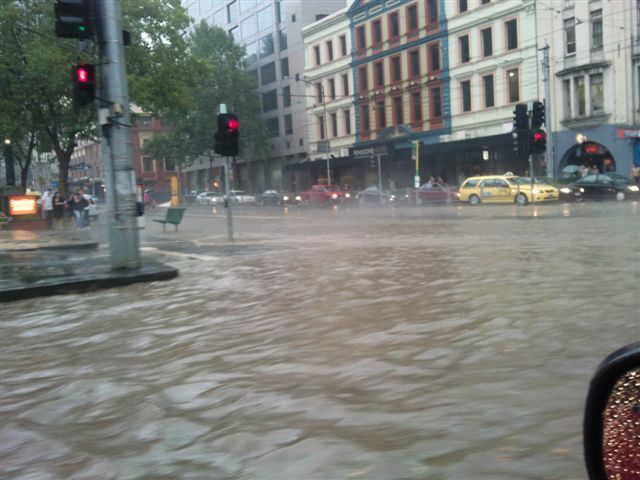 – our roads, bridges, water systems and wastewater plants. This election is about which candidate will nominate Supreme Court justices who are prepared to overturn the disastrous Citizens United decision which allows billionaires to buy elections and undermine our democracy; about who will appoint new justices on the Supreme Court who will defend a woman’s right to choose, the rights of the LGBT community, workers’ rights, the needs of minorities and immigrants, and the government’s ability to protect the environment. This campaign is about moving the United States toward universal health care and reducing the number of people who are uninsured or under-insured. Hillary Clinton wants to see that all Americans have the right to choose a public option in their health care exchange, which will lower the cost of health care. She also believes that anyone 55 years or older should be able to opt in to Medicare and she wants to see millions more Americans gain access to primary health care, dental care, mental health counseling and low-cost prescription drugs through a major expansion of community health centers throughout this country. Hillary is committed to seeing thousands of young doctors, nurses, psychologists, dentists and other medical professionals practice in underserved areas as we follow through on President Obama’s idea of tripling funding for the National Health Service Corps. In New Hampshire, in Vermont and across the country we have a major epidemic of opiate and heroin addiction. People are dying every day from overdoses. Hillary Clinton understands that if we are serious about addressing this crisis we need major changes in the way we deliver mental health treatment. That’s what expanding community health centers will do and that is what getting medical personnel into the areas we need them most will do. Hillary Clinton also understands that millions of seniors, disabled vets and others are struggling with the outrageously high cost of prescription drugs. She and I are in agreement that Medicare must negotiate drug prices with the pharmaceutical industry and that we must expand the use of generic medicine. Drug companies should not be making billions in profits while one in five Americans are unable to afford the medicine they need. The greed of the drug companies must end. This election is about the grotesque level of income and wealth inequality that currently exists, the worst it has been since 1928. Hillary Clinton knows that something is very wrong when the very rich become richer while many others are working longer hours for lower wages. She knows that it is absurd that middle-class Americans are paying an effective tax rate higher than hedge fund millionaires, and that there are corporations in this country making billions in profit while they pay no federal income taxes in a given year because of loopholes their lobbyists created. This election is about the thousands of young people I have met who have left college deeply in debt, the many others who cannot afford to go to college and the need for this country to have the best educated workforce in the world if we are to compete effectively in a highly competitive global economy. Hillary Clinton believes that we must substantially lower student debt, and that we must make public colleges and universities tuition free for the middle class and working families of this country. This is a major initiative that will revolutionize higher education in this country and improve the lives of millions. Think of what it will mean when every child in this country, regardless of the income of their family, knows that if they study hard and do well in school – yes, they will be able to get a college education and leave school without debt. This election is about climate change, the greatest environmental crisis facing our planet, and the need to leave this world in a way that is healthy and habitable for our kids and future generations. Hillary Clinton is listening to the scientists who tell us that if we do not act boldly in the very near future there will be more drought, more floods, more acidification of the oceans, more rising sea levels. She understands that we must work with countries around the world in transforming our energy system away from fossil fuels and into energy efficiency and sustainable energy – and that when we do that we can create a whole lot of good paying jobs. All I did was remove the few paragraphs where the T-word was mentioned. In 2006, Sunnyvale applied for funding to add bicycle lanes on Maude Ave from Mathilda to Fair Oaks. Maude is a two-lane road with a center turn lane. 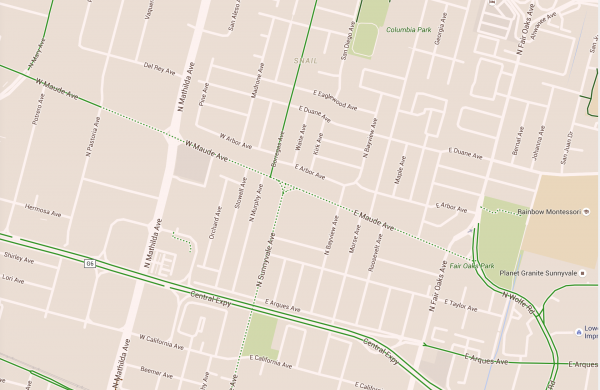 It serves as a main thoroughfare for the immediate neighborhood: residential, commercial, and Bishop Elementary. It also serves through traffic. It is very congested at peak. In the past three years there have been a few dozen accidents: mainly between vehicles, 3 involving pedestrians, 1 involving a cyclist. Sunnyvale Staff recommend Option 1: improve bicycle infrastructure but avoid increased congestion. Further detail desired regarding the causes of vehicle collisions along the corridor — details were not included in the present study. Project should extend the last half block between Fair Oaks and Wolfe Road — staff remarked that this was an oversight on the original grant request, but that this could be included for future improvement projects to the bicycle infrastructure on Fair Oaks or Wolfe. Drivers might park in buffered lanes. If left turn lanes are removed, drivers might use the bicycle lane to pass vehicles waiting for turn. Maude has many driveways, and it is safer for bicyclists further from the curb, where they are more visible to drivers utilizing driveways. Traffic impact analysis will be performed subsequent to the city selecting a preferred alternative, thus no traffic impact studies have been performed to distinguish the current proposals. I remarked on the lack of pedestrian crosswalks, asked the City to look at adding more as part of the project. I noted the advantages of using the parking as a buffer lane for cyclists: route bike lanes at the curb. I thanked BPAC for noting the desirability of an extension to Wolfe. One gentleman who used to live in the neighborhood spoke in support of bike lanes. One gentlemen from SNAIL explained his opposition to bike lanes, due to present low bicycle traffic. Asked if there had been any Spanish-language outreach, as this is the population occupying the rental housing and attending Bishop who would be most impacted by the project, especially removal of parking. City Council will review the plan May 17, 2016.
filesystem repair, and data compression. Ah, ZFS! The last word in filesystems! How very exciting that after a mere decade we have stable support for it on Linux. There’s a mention of the desktop: updates to LibreOffice and “stability improvements to Unity.” I’m not going to take that bait. No sir. private clouds, public clouds, or on developer laptops. I honestly don’t know what these do, but my hunch is that they have their own overhead of time and headache. Fortunately, I have semi-automated network install of servers, Ganeti to manage VMs, and Ansible to automate admin stuff, so I can sit on the sidelines for now and hope that by the time I need it, Openstack is mature enough that I can reap its advantages with minimal investment. Aside: My position on containers is the same position I have on Openstack, though I’m wondering if the containers thing may blow over before full maturity. Every few years some folks get excited about the possibility of reinventing their incumbent systems management paradigms with jails, burn a bunch of time blowing their own minds, then get frustrated with the limitations and go back to the old ways. We’ll see. maintain its existing processes for development and updates. Further research reveals that they’ve replaced Python 2 with Python 3. No mention of that in the email announcement. I’m totally sure this will not yield any weird problems. It started when Tom Limoncelli shared a link to teens reacting to Windows 95. What could be more amazing than that? How about this guy, with a 50 year old modem and a teletype, browsing the first web site via the first web browser, by means of a punch tape bookmark? At the debate, I was a little disappointed in Bernie. Ask him a question, ask for details, and he’d pivot to any one of several talking points about how we need to regulate the banks, shut down the prisons, hand out tuition … he is an idealist but he is still a politician. Presidential Debate Summary: mostly partisan, indecipherable yelling and screaming from a hangry toddler of undeclared political alignment. Debate Summary: Hillary loves Obama, helped kill Osama, says Bernie hates Obama. Bernie days he hates Kissinger, we shouldn't bomb Cambodia. Hillary, I like her fine enough. She had to go ahead and congratulate herself for being in the Situation Room to get Osama killed. Who wouldn’t brag about that one? Then near the end she tried to paint Bernie as a guy who is all busy hating on Obama. Bernie had a good retort that is was Hillary who ran against him in 2008. The weirdest part was when Bernie started going off about Henry Kissinger. The gist of it is that the man is a war criminal and pals with Clinton. Maybe he could goad her into defending a war criminal? She handled that deftly: she’ll take advice from anyone. I’m no Kissinger fan but that was one of several times when Bernie’s focus seemed more on the mid-20th century than the present day. I appreciate historical perspective, but I worry about the guy coming off as stuck in the past. I found a good explanation on the Kissinger thing here at “The Intercept”. The gist of it is that yes, Kissinger is an impressively heinous character and a friend of Hillary Clinton, and that there is a larger issue, that Left or Right, there’s a little cabal of hawkish Neocon-leaning foreign policy advisors that make up the Washington Foreign Policy Establishment. Bernie has been dinged for not articulating his vision for foreign policy, but when he lights up on Kissinger, he’s using Kissinger as the bellwether poster child for the Foreign Policy Establishment. He’s essentially saying what he says on a lot of stuff: we can do better. The test of a great and powerful nation is not how many wars it can engage in, but how it can resolve international conflicts in a peaceful manner. I will move away from a policy of unilateral military action and regime change, and toward a policy of emphasizing diplomacy, and ensuring the decision to go to war is a last resort. As secretary of state, I worked to restore America’s leadership in the world. As president, defending our values and keeping us safe will be my top priority. That includes maintaining a cutting-edge military, strengthening our alliances, cultivating new partners, standing up to aggressors, defeating ISIS, and enforcing the Iran nuclear agreement. Obama’s disengagement has contributed to growing threats to our national security, including radical Islamic terrorism, Iranian aggression, an emboldened Putin, and an assertive China. Adversaries do not fear us and allies do not trust us. I will rebuild America’s military, restore our credibility and leadership, and repair our broken alliances. It would seem that this isn’t about Bernie being stuck in the 20th Century. Bernie’s beef is that Washington is stuck in the late 20th Century. The same advice that got us in bed with the Shah of Iran, that stoked the revolution there, is the same advice that got us mired in Vietnam and armed Al Qaeda, is the same advice that later got us mired in Iraq, and it is this same advice that is likely to bite us in the future. I think one could debate the merits of interventionism versus the blowback and unintended consequences. 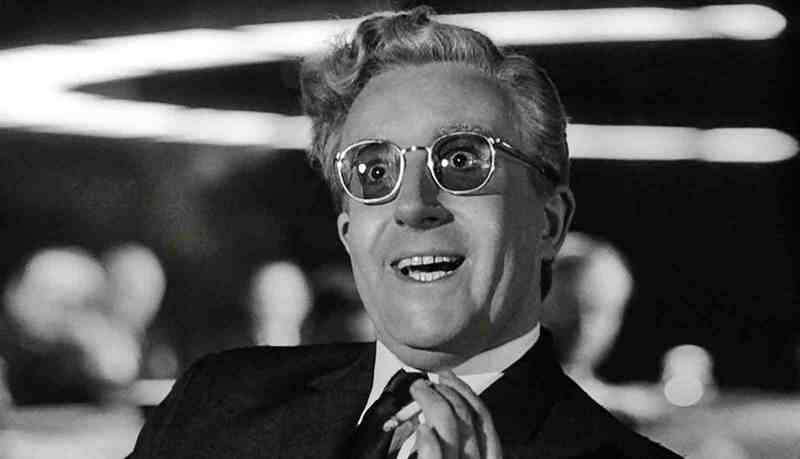 Okay, Kissinger is a bad guy: I get it. Bernie, what should we do different and how do you honestly figure it will play out? Americans are not naturally fond of interventionism, but it seems to have worked well enough for us most days. Most days, it is foreigners who pay the price. Foreigners … and our soldiers. In Vietnam it was The Draft and it seems that everyone in my parents’ generation carries some subtle emotional scar from that. Foreigners, soldiers, conscripts … on 9/11 it was office workers, police and firefighters. But we don’t talk about 9/11 as blowback for interventionism. “The war against ISIS, a brutal and dangerous organization, cannot be won unless the Muslim nations which are most threatened — Saudi Arabia, Kuwait, Qatar, Turkey, Iran and Jordan — become fully engaged, including the use of ground troops,” Sanders said. “It must be destroyed not just by the United States of America alone. In many respects, what ISIS wants is a clash of civilizations,” Sanders said. “I fear very much that supporting questionable groups in Syria who will be outnumbered and outgunned by both ISIS and the Assad regime could open the door to the United States once again being dragged back into the quagmire of long-term military engagement,” he said. From what I can see, Bernie articulates what sounds to me some reasonable ideas about foreign policy. Nations have to take care of their own regional problems. We should help out. But we can’t win what isn’t really our fight. What does Clinton have on offer? To support troops from Iraq and around the region, the U.S. should “immediately deploy the special operations force President Obama has already authorized and be prepared to deploy more as more Syrians get into the fight,” Clinton said. Oh Google, your algorithms seem to have a Socialist bias. At any rate, I feel better about where my sympathies lie.